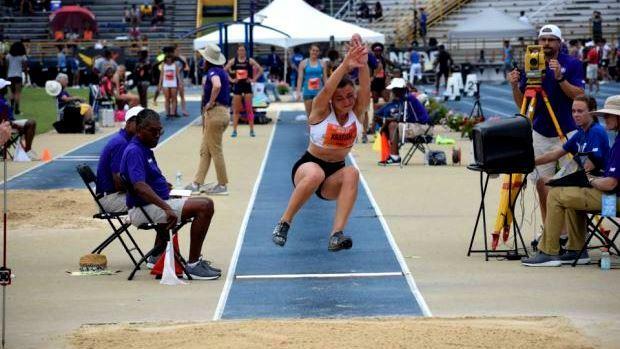 A few more MA athletes earned All-American status on Saturday by finishing among the top 6 in the Championship Events during Day 2 of the New Balance Nationals Outdoor Championships. Lexington clocked a more than four-second PR to finish third overall in the 1,600m Sprint Medley Relay. The Minutemen combined for a state-leading time of 3:28.11. Belmont's Anoush Krafian (see above) collected 4,721 points to place fifth overall in the girls' Heptathlon. Krafian finished up the two-day competition by clearing 5 feet, 6 inches in the high jump. That height matched her PR and scored 830 of her points. She also was timed in 2:31.13 for 800m (679 points), tossed the javelin a distance of 86-7 (409 points) and leaped 16-3.25 for the long jump (551 points). Tristan Shelgren of St. John's Prep claimed the coveted sixth spot in the 2,000m steeplechase where he clocked 6:01.59. King Philip's Michael Griffin was tenth overall with a time of 6:06.14. North Andover sophomore Sarah Lavery came through with the biggest jump of her young career. Lavery won the Emerging Elite High Jump with a state best of 5-8.75. Her effort was a PB by more than two inches! In the Freshmen Triple Jump, Darius Robinson of Amherst-Pelham was 11th overall with a distance of 40-9.75. Amherst-Pelham's Sophia Jacobs-Townsley and Norton's Julia Palin finished 1-2 in the Emerging Elite Two Mile. Jacobs-Townsley broke the tape in 10:58.88. Palin was timed in 11:01.89. Taking eighth overall with a time of 11:12.88 was Mohawk Trail's Meghan Davis. Innovation Academy's Aiden Felty tossed his second 60-plus footer of the season in the Championship Shot with a near PR of 61-1.75. That effort earned him a ninth-place finish. Brandon Hall of Hopedale placed tenth overall in the Emerging Elite 2M with a time of 9:34.56. Sydney Masciarelli of Marianapolis Prep finished 12th overall in the Championship 2M with a PB of 10:49.15. A day after winning his first national title in the 5K, Andrew Mah earned All-American status again. Mah won his heat and finished fifth overall in the Championship 2M with a time of 9:13.30. Nate Hobbs of St. John's Prep leaped an all-time best of 47-6.25 to finish 17th overall in the Championship Triple Jump. Oakmont Regional's John Qaouette blazed to a PB of 10.76 in the preliminaries of the 100m dash. He also finished second overall in the EE 200m where he ran another best of 21.69.